○ The disappearance of visiting Chinese scholar Zhang Yingying in the US has attracted a lot of attention on Chinese cyberspace. ○ The slow progress in finding Zhang has led many netizens to criticize the efficiency of the US police. ○ Some Chinese parents have begun to wonder if it is safe to send their children to the US. 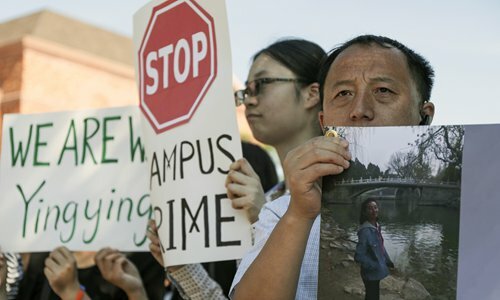 The fate of Zhang Yingying, a 26-year-old visiting scholar in the US who is believed to have been kidnapped and is supposed dead, has sparked heated discussion on the efficiency of US legal system and the general safety of the country on Chinese social media. Zhang, a visiting scholar studying photosynthesis and crop productivity at the University of Illinois at Urbana-Champaign in April, was reported missing on June 9 after she didn't return from a trip to sign an apartment lease. Security video footage showed that Zhang was waiting at a bus stop when a man driving a black sedan approached her. After speaking to him for a minute, Zhang got inside the car. Three days after she was reported missing, the man was identified as Brendt Christensen, a former doctoral candidate at the university's physics department. The FBI obtained a search warrant for Christensen's vehicle on June 14, and arrested him on suspicion of kidnapping Zhang on June 30. By then, Zhang was believed to be no longer alive, according to US law enforcement agents. The circumstances of Zhang's kidnapping drew nationwide interest on China's social media due to her excellent educational background, the apparent uncooperativeness of the suspect and the fact that Zhang's body still hasn't been found over a month later. Many netizens have questioned the efficiency of the US legal system. Zhan Hao, a patriotic blogger with over 1.57 million followers on Sina Weibo, wrote, "Whether it's the US police or the FBI, their case-solving abilities are not even as good as our county-level police. They finally found the suspect a month after Zhang went missing, who turned out to be a doctoral student and RA at Zhang's university. With this low skill level, no wonder they are only able to resort to bullets. The miracles of US police are only Hollywood depictions!" The post was shared over 800 times. Chen Yunguan, a home decorator in East China's Fujian Province and Weibo user, has been following Zhang's case since June and has been disappointed with the FBI's handling of the case. In one blog post, he posed six questions to the FBI, questioning its performance. His questions include why it took the FBI three weeks to arrest the suspect, why their interrogation has been fruitless and whether it's really impossible to make the suspect speak. He is also concerned about the general safety of the US. "The US is not as safe as China. Everyone knows about the gun problem in the US, and that they lack supervision over guns," he told the Global Times. Even the Communist Youth League of China joined the discussion on US safety. Its official Weibo account posted an article entitled "Want to have some kebabs late at night? Sorry, the US can't give you the sense of security to do that," asking overseas students to mind their safety on public transport, avoid areas with few pedestrians or high crime rates, and make as little eye contact as possible with strangers. Similarly, the Xinhua News Agency, China's State news agency, warned against the high crime rates in the US in an article entitled "Why can't people have kebabs late at night in the US." "You don't even need to look at the numbers. Just check the local news and you'll find that there is almost not a single day when a crime doesn't happen. Just on the week prior to US July 4th national day, a black woman was killed in a road rage shooting by a white man in Pennsylvania, two died and 6 wounded in a shooting in a New York hospital, and 25 were wounded in a shooting at an Arkansas night club." Others questioned why there are so few surveillance cameras in the US compared to China, which made it difficult for police to track the route of Christensen's car on the day Zhang disappeared. "Zhang's case has made people realize that there are far fewer surveillance cameras in the US than in China. In Beijing, apart from when you're home, everything you do is literally monitored by surveillance cameras," Chenai Wenzi, a Weibo user, commented. "I understand that it's probably because surveillance cameras infringe upon privacy and cost taxpayers' money, but if I'm in the US, I would prefer that there are more cameras to prevent crimes. Criminals will then be deterred, and it will make it easier for the police to carry out investigations," he wrote. This is not the first time that the death of a Chinese student in a foreign country has attracted public attention in China. Many associated Zhang going missing with the death of Elisa Lam, a Chinese Canadian student who died mysteriously during a trip to the US in 2013, and whose strange behavior before her death, recorded by a camera in her hotel's elevator, drew international interest. After she was reported missing in January 2013, the police were unable to find her body until repairmen at her hotel spotted her body in the hotel's water tank. The police's conclusion, that her death was an accidental drowning, left many being skeptical as there are many unresolved issues in the case. These cases have left many Chinese with the impression that the US is not safe. Many Chinese parents who planned to send their children to the US are now questioning if it's a good idea. "I planned to send my daughter, who's in her first year of middle school, to the US for high school. After reading so many posts about how unsafe it is in the US, I'm now unsure if I should have her study in Canada or in Britain instead," Wu Shaohua, a 41-year-old mother in Shanghai, told the Global Times. Sarah Zhang, a 29-year-old Chinese student now studying in California, said her mom has been forwarding her articles about the investigation into Zhang's case every day in the past week. "She told me she couldn't sleep, and said she shouldn't have allowed me to study in the US," she said. While some question the safety of the US and the efficiency of its police, others are trying to explain the US legal system to the Chinese public. You Tianlong, a Chinese doctoral student in justice studies at Arizona State University, said many Chinese people's mistrust of the US legal system is unfounded. "The misunderstanding of some members of the Chinese public is mainly due to their unfamiliarity with the US legal system, and some media's intentional distortion," he told the Global Times. You has been writing in the Chinese media that the reason why the FBI waited several weeks to arrest Christensen was not because of their low efficiency, but due to the country's legal system. "In order to protect citizens' property rights and privacy, law enforcement officers have to obtain a search warrant before they search private properties," he said. "According to the indictment, the FBI's investigation is completely legal, and the court's issuance of the search warrant was timely," he said.